Grooming routines and tools will vary based on fur length and breed of cat. For most short-haired cats, frequency of grooming can be left to owner preference, whereas long-haired cats require daily maintenance. However, short-haired cats that are ill, injured, or arthritic may require additional grooming from their owners. Owners should provide opportunities for their cats to become accustomed to grooming at a young age. If this isn’t possible and the cat dislikes being groomed, brushing the cat for just a couple of minutes several times a day and then letting her go can help her to become more comfortable with the procedure. Eventually, single longer grooming sessions can be implemented. Cats with long fur should be brushed daily to prevent tangles. To groom a long-haired cat, use a wide-tooth comb to gently remove any knots in the fur – owners should tease knots apart with their fingers and then comb them out once they have been loosened. If a knot is severe, it will have to be cut out. After using the wide-tooth comb, the grooming session can be finished with a run-through using a soft natural-bristle brush or fine-tooth comb. Long-haired cats are more likely than short-haired cats to pick things up on their fur such as burrs. Burrs can often be removed using a little vegetable oil to loosen them up. If this doesn’t work, the burr should be trimmed out immediately. It’s important to maintain a daily grooming routine for long-haired cats (or at the very least, every two days). Allowing the cat’s coat to become matted with tangles may necessitate a full shave by a professional groomer or veterinarian. Mats should never be left in the fur, as they can restrict movement, harbour parasites, cause the skin to tear, and lead to skin rashes and other medical problems. Those who don’t have time to conduct daily grooming sessions should not adopt long-haired cats. Although the fur of short-haired cats doesn’t tangle, many short-haired cats, such as the Exotic, have a thick undercoat that is particularly likely to cause hairballs, which can lead to vomiting or constipation (see Preventing Hairballs in Cats for information on safe hairball treatments). Short-haired cats can be groomed using a fine-tooth comb or a soft brush. 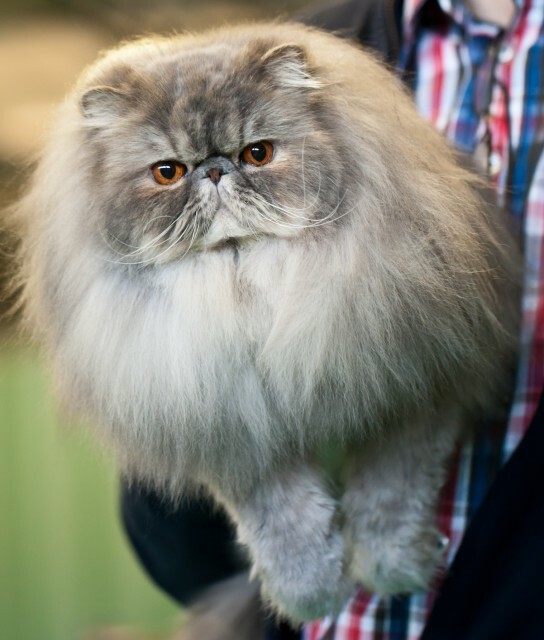 For cats that will be shown at cat shows, chamois cloth can be used afterward to make the coat exceptionally shiny. Although frequent combing isn’t necessary to prevent tangles in short-haired cats, regular grooming (once a week or more) is beneficial for preventing flea infestation, as a fine-tooth comb can be used to remove flea eggs before they hatch. In addition, grooming provides an opportunity to inspect the cat for lumps, bald patches, or skin problems that may be caused by allergies or medical issues. Also, many cats enjoy being groomed, and it provides an opportunity for owners and cats to spend quality time together. Cat breeds such as the Persian, the Himalayan, and the Exotic usually require regular cleaning of the face to remove discharge from the eye area. There are commercially available products designed to temporarily relieve tear-staining in these breeds, and discharge can also be gently wiped away using a cloth moistened with warm water (no soap). This will usually need to be done a couple of times a day. If discharge is excessive, consult a veterinarian. If necessary, the exterior portions of a cat’s ears can be cleaned using a cotton ball moistened with warm water. Clean only the part of the ear that is visible – never try to insert anything into the ear canal, and never use Q-tips except under the advice of a veterinarian. If the ear canal requires cleaning, this should be done by a veterinarian who has the proper tools and the necessary skill to avoid causing injury. Claw trimming is required for participation in cat shows, and many pet owners choose to clip the tips of a cat’s nails rather than resorting to the cruel practice of declawing. Unlike declawing, trimming the claws isn’t painful and it doesn’t completely and permanently remove a cat’s defenses or his ability to climb. To trim the nails, first make sure that the cat is held securely so that he can’t move suddenly and be injured by the clippers. Next, gently squeeze a toe to expose the claw. Near its base, there is a pink area. Be careful not to cut into this, as nicking this area will cause pain and bleeding. Cut only the white part at the sharp tip of the claw. When trimming a cat’s nails, always use proper claw trimmers rather than scissors. Claw trimmers are inexpensive and can be purchased at most pet supply stores. Providing dental care from time to time as part of the grooming routine can reduce the likelihood of tooth loss or expensive veterinary bills for dental care later on. There are commercially available toothbrushes and meat-flavoured toothpastes available for cats. For information on providing at-home dental care, see How to Brush a Cat’s Teeth. Most cats don’t require regular bathing unless they will be participating in cat shows or have gotten a substance on their fur. See How to Give a Cat a Bath for information on how to safely bathe a cat. Commings, Karen. (1999). Guide to Owning an Exotic Shorthair Cat. Neptune City: NJ: Chelsea House Publishers.